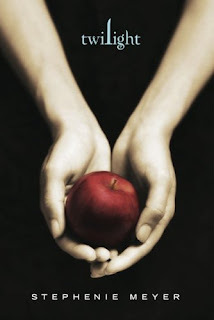 I have been bitten (no pun intended) by the Twilight fever that has been gripping one and all. Or at least it seems that way. I had never heard of the book until 2 weeks ago and my BFF said to me "You have got to get this book, it's awesome!" So on my last trip to Costco I headed on over to the book section and there it was. How my hot little hands burned to get it home and start reading. It took a few days for me to actually get to start it, but Saturday was the day. I finished it yesterday. It was that captivating. Being sick helped, I had an excuse to laze on the couch and read amongst the coughing/sniffling/nose blowing. I feel like Harry Potter mania has hit again. Except this story involves vampires, not wizards. I fought the urge to go online and "see" what the actors from the filmed looked like, I wanted to form an opinion in my mind first. I'm glad I did, they look like they should to me. Morgyn has now taken over the book. Myself I need to get to the bookstore for the other books in the series, apparently I'm a few books behind. Oh my GOSH! You are going to LOVE the other books. I didn't think they could get any better ... . but the last book ... ? OH MY GOSH!!! And how excited are we that the movie is coming out? And that the casting was decent? OH. MY. GOSH . . . ! ! ! ! ! I wish you had already read it so we could swap notes!!! Yeah ... I am counting down the days to the 21st. That's when it hits theaters here. There too, yeah? Oh my!!! I consumed these books like a mad woman!! Glad you are enjoying them! I hope to convince someone to go with me to see the flick!